This work was published at CHI 2017 in Denver, CO. This project focuses on using augmented reality in a novel way, in this case, as a note taking system for museum professionals. We proposed to use a pen as an input device for an augmented reality system that would allow museum professionals to take notes in 3D space, which could then be used and studied by other art historians and museum professionals. Because we did not have access to an AR headset like the Microsoft HoloLens, we had to be creative in testing. We combined several methods, pulling from body storming, participatory design, and standard usability testing. What interaction methods beyond the standard set are available in AR? What can we do in AR that we can't do in other mediums? Art historians face a specific set of challenges. They study unique artifacts that are often related to other items they are often not able to access directly, either because they are protected, or on the other side of the world. Because of these limitations, they frequently use photographs to study related objects that are not located in their collection. These photographs can leave out important details that these museum professionals need. In this paper, we examine an Augmented Reality application that would allow users to view these artifacts in three dimensions, and annotate them directly using a stylus pen. While museum patrons could make use of augmented reality technology, it would require AR headsets to be ubiquitous, or a museum to invest money in expensive headsets, then build the infrastructure to rent and maintain them. The museum is a quiet space for many people, and AR headset wearers using hand gestures and voice commands in the museum might be distracting. It is very hard for museum professionals to access artifacts they need to study, as they are spread all over the world in museums or private collections, if they exist at all. Museum professionals have begun to use 3D models to preserve and study artifacts. These insights led us away from designing for museum patrons and towards a design for museum professionals. Initially, we were designing concepts focused on museum patrons and how we could realize a museum experience in the HoloLens. A concept of an augmented reality room, that would be completely transformed in the headset. A concept exploring an idea allowing a user to reconstruct a statue over time, visualizing what it might have looked like in the past. 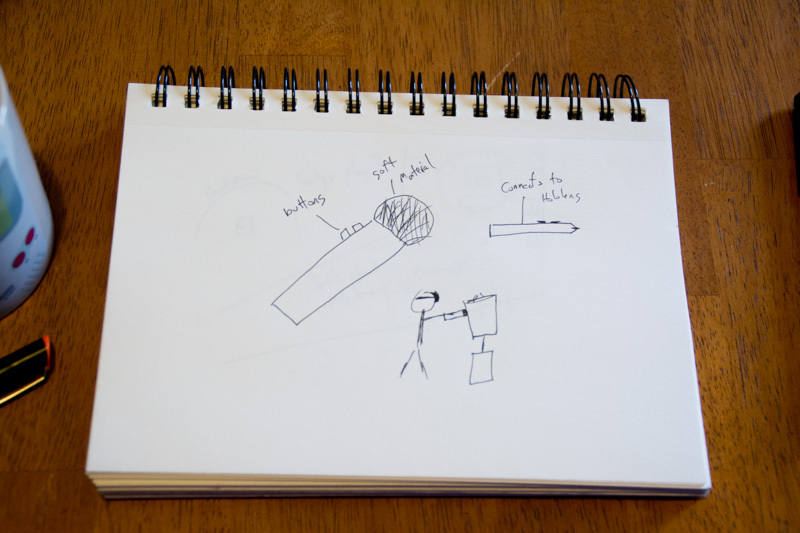 A sketch on an experience in which users would have small items like gemstones, coins or jewelry enlarged in the augmented reality headset. We also wanted to ensure that our concept would be unique to AR, rather than simply a VR or screen experience forced into AR, so we did an analysis of the various concepts we imagined, trying to determine which could be done in VR or on a screen, and discarding all but those that worked best in AR. We completed this analysis after considering the various features of each technology. An analysis of concepts focused on which could work in AR. We focused on concepts that were mainly usable in AR. Goal - The design started to coalesce when we realized that current interaction techniques in AR, such as hand gestures and voice commands would not support our user group. They simply weren't precise enough. We needed something tactile and precise, that could work in 3D space. 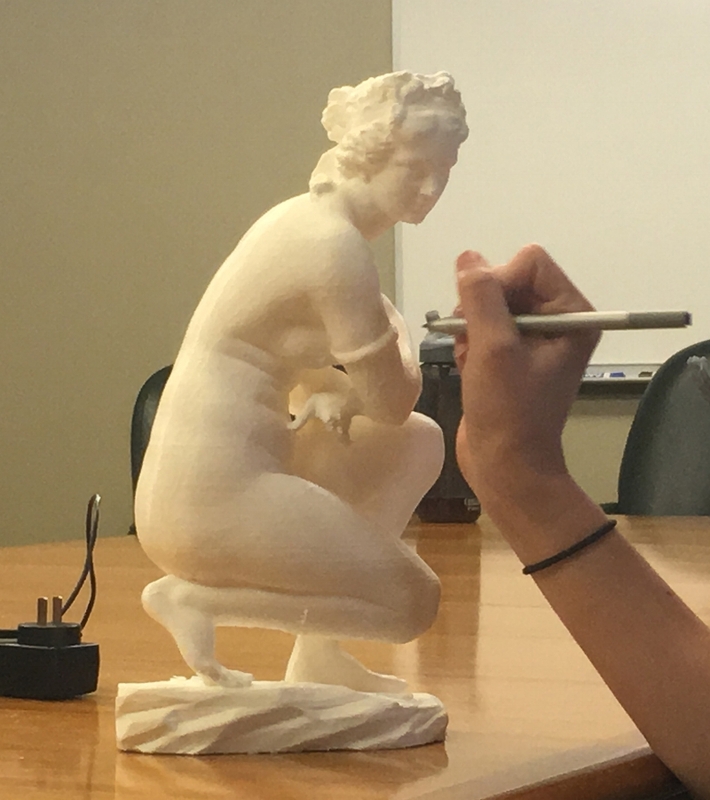 Result - We imagined a pen-based interface that would allow users to touch the surface of a statue, that would create a virtual point in the headset for the user to attach to a note, or some other kind of information. An early concept of the pen, including a reference to how the tip would have to be able to touch the artifacts without damaging them. Goal - Once we hit on the idea of a pen that users would use as an interactive device, we began developing functionality for this device as it related to museum professionals. 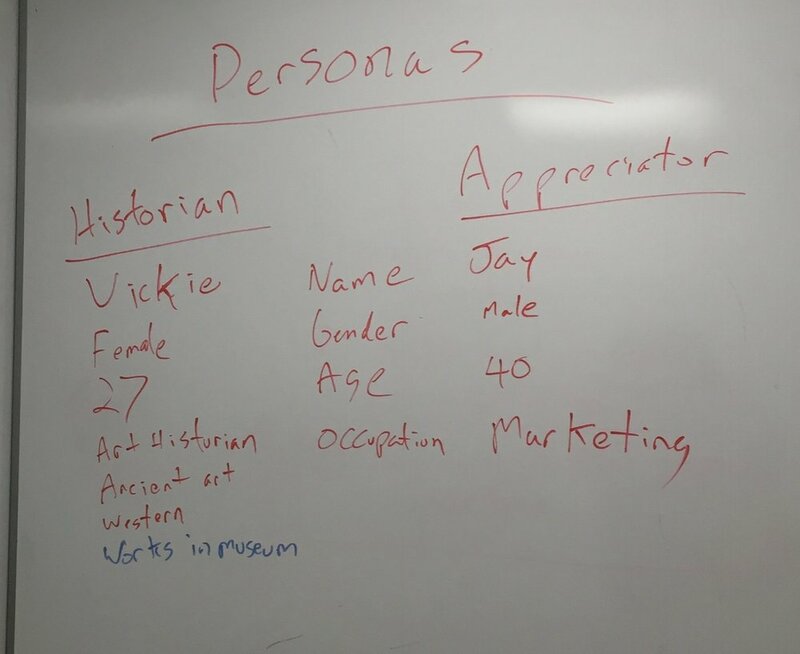 To do this, we wrote a story involving our persona using our device to study a statue. Result - Using the story informed by our research, we were able to understand how a museum professional would approach this artifact, and how an augmented reality system might help them. We solidified how note-taking would work, what types of notes were available, and how they would be shared. We also imagined how buttons on the pen could be used to change modes or activate different features. These iterations allowed us to move into a testing phase. We had no access to the priceless artifacts that we hoped to make more accessible. We needed a testing method that worked like paper prototyping, but in 3D space. An image of the Crouching Aphrodite during a test, a user is attempting to take a note with the provided pen. new context based pen interactions, including using the pen as a level line and a voice recorder. In this project, I learned how to become a leader on a design team. I have had many leadership roles in the past, but this was the first time I was the most experienced designer, with everyone else on the team looking to me to guide things and make final decisions. I embraced this role, guiding the process for the less experienced designer on the team, and helping the art historian understand design methodologies and processes. It was also up to me to decide how to proceed with testing. To do this, I drew on my training using design research methodologies, and combined the methods I needed to get the information required. As to the questions I wanted to answer, we discovered through our research that hand gestures and voice commands simply weren't precise enough for our user group. This led us to the pen idea fairly quickly. In testing, it worked well, so we only iterated on the functions available and how they would operate. We also worked hard to explore what AR was capable of, and what would work well in AR vs other technologies. While we didn't have a HoloLens at the time, much of our research proved accurate when we acquired a HoloLens soon after this project completed. This project also opened my eyes to the vast potential of augmented reality as a new paradigm of computing. I think one of the most interesting things we did in this project was challenge the existing interaction methods that are being studied in AR, namely hand gestures and voice commands. I believe that AR is the future of computing, and that the technology up to this point has been very driven by technology and engineering. It's time for the designers to get involved and start bringing human needs back into this technology.